Technology is enabling more people to get mental health counseling, even if they can’t get to a therapist’s office. 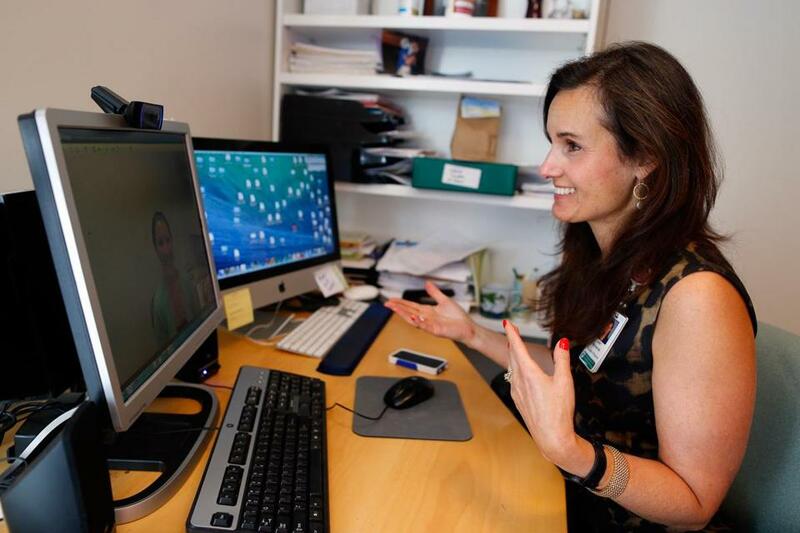 Janet Wozniak, associate director of the Bressler Program for Autism Spectrum Disorders, uses video-conferencing technology to talk with her patients and colleagues at her office at Massachusetts General Hospital. Facing a new diagnosis of cancer, Josh Stoffregen needed his therapist more than ever. But with daily chemo and a depleted immune system, leaving his home in the winter to see his psychologist in her Manhattan office was a risky venture. So his doctor, Chloe Carmichael, offered him an unexpected option: What about Skype? With that, Stoffregen was able to continue to see Carmichael, virtually. They spoke at least once weekly while he recovered in the hospital after surgery and after he had made it back home but was too weak to go to her office. As therapists don’t do physical exams, the field is perhaps uniquely suited to transition from face-to-face meetings to online appointments. Despite hurdles related to insurance reimbursement and concerns about whether an interpersonal connection can survive in the virtual world, proponents say that online therapy is an effective solution to bring mental health care to those who might not otherwise get it. Sitting in her office at Massachusetts General Hospital, Janet Wozniak, a child and adolescent psychiatrist who is the associate director of the Bressler Program for Autism Spectrum Disorders, faces a computer screen. When a patient checks in to a “virtual waiting room,” an e-mail message alerts her to the arrival. Then the online visit begins. Michelle Picard and her daughter Marie are one of the families approached by Wozniak. Marie, who is autistic and has bipolar disorder, has been seeing Wozniak for more than a decade. It hasn’t been easy. Sometimes Marie would grow so agitated in the waiting room that appointments had to be abbreviated or aborted. Other times she’d grow aggressive during the long, traffic-heavy car ride from her school south of Boston to the appointment. The initial goal for the pilot program to include 10 online psychiatry visits has become hundreds, and expanded beyond autism to patients with a variety of psychiatric conditions including depression, anxiety, obsessive-compulsive disorder, and substance abuse. There have been some kinks. Sometimes the computers have trouble connecting. Wozniak has learned that because her camera sits above her computer screen, she needs to look up, at the camera, to make it appear as though she is looking directly into the patient’s eyes. But the improved access and efficiency of visits outweighs any technology-related drawbacks, Wozniak said. And Wozniak describes unexpected benefits. For one, she’s met family members who are present in the background of the online session. She can see details about where her patients live. And without the stress of getting to the office on time, patients are actually more relaxed and engaged — allowing an interpersonal connection that is just as good as, if not better than, a face-to-face visit. “This is the wave of the future,” she said. That has been the goal for a California-based company called Breakthrough, which aims to set up contracts with insurance companies so that they will offer online therapy to their members. It took Breakthrough two years to secure its first contract with an insurance company willing to reimburse online therapy visits, but as acceptance of online therapy increases, Breakthrough has expanded to eight states across the country, said Julian Cohen, the company’s chief executive officer. Log onto the website, and you can search by location and insurance company to find photos and brief biographies of therapists whose training ranges from psychiatrist to psychologist to social worker. While at first blush, the company might resemble an online dating site, Cohen noted that potential therapists must pass a vetting process and a training that includes lessons on best practices in telemedicine in addition to more pragmatic tips, like how to use the company’s teleconferencing software and where to place the lighting in preparation for an online session. (In front, not behind.). Ultimately, determining which patients could benefit from online care and who would be better served by seeing a therapist face-to-face is up to the provider. But in some cases, for patients who live in areas where the closest therapist is some 50 miles away, “The other choice might be no care at all,” Cohen said. Accessibility aside, does online therapy actually work? That was the question that faced Steven Hyler, who is on the faculty of Columbia University in the Department of Psychiatry, and who previously coordinated New York State Psychiatric Institute’s telepsychiatry consultation program. For about a decade, he worked to arrange virtual psychiatric consultations for patients without easy in-person access, from inmates at maximum security prisons to patients at rural community medical centers. Over the years, Hyler became familiar with the pros and cons of seeing patients through a computer screen. That’s what Stoffregen found during his months of illness. He’s now back at work in public relations in New York. Out of town on a business trip a few months ago, he had a cancer relapse scare. He called Carmichael, and “through modern technology we were able to connect and have a quick session,” he remembered. Even when he’s in the city, he finds that he’ll still sometimes choose Skype sessions from the couch in his living room instead of an in-person meeting. Dr. Daniela J. Lamas can be reached at danielalamasmd@gmail.com.